Some would say that the Western world is going through a psychedelic renaissance, with psychoactive substances such as psilocybin ("magic" mushrooms) and LSD reentering the scientific realm of research. 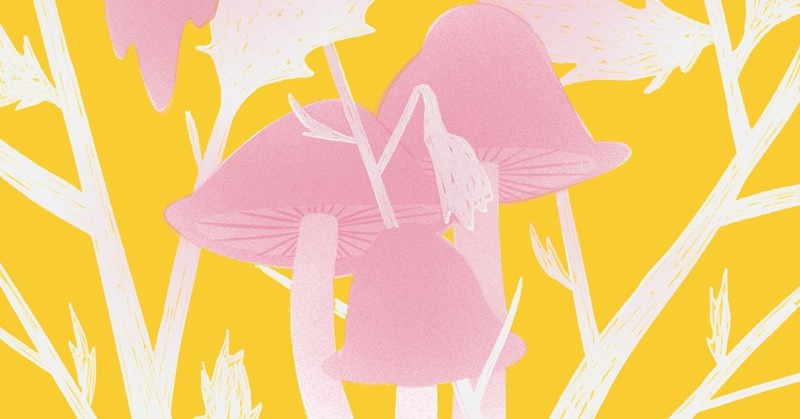 While new light is being shed on the therapeutic benefits of these substances, there remain many questions about the hallucinations that occur during such experiences. One such question is, why do some hallucinogens seem to cause universal hallucinations? Why, for instance, did you and all your friends see an elf hiding in the bushes while tripping on acid? When experimenting with [the highly dangerous] Datura for instance, many have reported visions of a woman, who is referred to by indigenous cultures as Queen Toloache, the "spirit" of the plant. Or Westerners who take hallucinogenic Ayahuasca—a medicinal plant used by indigenous cultures of Central and South America—often report seeing jungle flora and fauna, despite never having been to the Amazon themselves. We speak to neuroscientists, pharmacologists and psychedelic researchers about the uncanny phenomenon. It’s hard to research this phenomenon because it’s hard to test what a subject’s perceptions are without giving away that they are being given a hallucinogen. You can’t just stick it in their water and then see what happens, so if you are trying to get an unbiased—and subject-naïve—view of the effects of one of these powerful hallucinogens on a person, it is difficult. In his book Mescal and Mechanisms of Hallucination, Heinrich Klüver talks about commonality of visual hallucinations, and the early stages of visual hallucinations are very stereotypical, and the theory is that they are reflecting the wiring in the visual cortex. Things like very simple geometric patterns or puddles, or even spirals and things like that, these are seen even in Paleolithic art and are very common across various cultures. These motifs even occur in the scribbling or doodling of children, and German airplane pilots in WWII that were flying very high up in the atmosphere were reporting similar hallucinations from lack of oxygen. So the theory goes that it’s an externalization of our existing internal patterns. Anecdotally, a bunch of friends of mine and I in college were watching [sci-fi movie] Silent Running. In the movie, Bruce Dern is the only man left on earth, and he has a garden. He has this little robot that ran around and maintained the garden, and when my friends and I took LSD several hours later, we also saw this robot. So my anecdotal guess is that when a group all hallucinates the same vision, that it’s a subject that may have come up earlier in the day that was buried deep in the consciousness. My best possible answer is that Western science hasn’t a clue. However, if you ask the shamans who use different plants and have done so for hundreds or thousands of years, they will tell you that the visions that occur are often similar. This is because they say that you are being introduced both to the spirit of that particular plant and to the spirits (animal, plant, or energy being) that is associated with that plant. If you’re comfortable with the notion that plants have intelligence and are part of the habitat of other intelligences, then this is common sense; just as everyone who goes to France finds that most of the food is French, or people who go to Spain or Italy find cuisine different than France but similar to what people in Spain or Italy are eating. But if you are still committed to the notion that the only kind of intelligence is like ours in some way, you will feel that the question has not been at all answered [by Western science]. Some of the "hallucinations" that are visual and geometric patterns or fractals are probably related to the similar architecture of the parts of the brains that are affected by psychedelics. Some of the visions (cougars, animals, jungle scenes) may result from the setting, and preconceived notions that users may have. For example, ayahuasca comes from the Amazonian jungle and there is a huge folklore surrounding the origin and use of ayahuasca. The expectations of users can be a major determinant of what happens after ingesting the substance. But no one can tell you what is happening when people experience ego death and feel a one-ness with the universe, or an experience of God, or have a powerful mystical experience. That remains a mystery, but a fascinating one that will bear scientific scrutiny in future years. I think the political landscape is changing, and changing very rapidly with respect to curiosity about these unique substances. journalist and author of Aya Awakenings: A Shamanic Odyssey "Experiential"
Currently through tests they’re doing at the Heffter Institute, the Buckley Foundation and the Multidisciplinary Association for Psychedelic Studies, they’re positing to the fact that a lot of psychoactive turn off certain regions of the default mode network in the brain, and the substances themselves aren’t necessarily causing hallucinogenic experiences, but are switching off these regions of the brain, and the brain itself is receiving a denser spectrum of consciousness. It’s just that we’ve had a reducing valve on the brain, which is Aldous Huxley’s theory; throughout his book The Doors of Perception: Heaven and Hell, he thought perhaps that the brain was perhaps a reducing valve, while there’s actually a vast spectrum of information that we’re just not seeing. So modern scientific testing is corroborating that, actually. So when taking a psychedelic, you’re being exposed to a wider spectrum of reality—it was always there, we just don’t see it. If you take something like Ayahuasca, which many indigenous Central American tribes would use, they have a consensual paradigm of reality that they’re experiencing through the usage of Ayahuasca. Now, it’s very interesting because even Westerners who take Ayahuasca report seeing things like jaguars in the jungle, or nature, or totems and things like that. And people wonder, well why are those cultural archetypes present? There’s all of this computer terminology that helps to give framework to describe a psychoactive experience—so we can say that it’s almost like having a website page bookmarked. So if indigenous cultures are defining this “page” so to speak, who live in the jungle where they experience things like jaguars and boa constrictors, they’ve defined each one of those as an archetype that represents a deeper spiritual totem. So if over thousands of years, tens of thousands of people in these tribes have built up these archetypes on these energetic visionary frequencies, these frequencies are defined—we just don’t really see them. Just like the internet. You don’t really “see” the internet; it’s a spectrum of existence that is always there, but you only see it when you log onto it. So in a way, you’re “logging onto” a visionary frequency, but other cultures have been there before, building it. So in a way, their experiences are “bookmarked” so when Westerners take it, they might see a jaguar even if it’s not in their personal cultural archetype. And people are reporting anecdotally that, even having no connection to the Amazon, that they are seeing Amazonian imagery. What science still cannot confirm nor deny is the root cause of consciousness. If consciousness is as Huxley said, are we acting as a transmitter of information, a receiver, or both? If we are a receiver—which the default mode mechanism that psychedelic studies are sort of pointing to at the moment, it means that there is a broadcast signal on which these archetypes exist. It’s like Plato’s allegory of the cave—there’s an archetypal realm from which our physical reality come from. One of the main Ayahuasca tribes in the Amazon called the Shipibo say that the Ayahuasca dream state is the original state of being, the originating source world, and that this world is a projection from that one. It’s very similar to what quantum theory calls the implicate and the explicate orders. Science says that these visions are all from within the brain. But what they’re not asking is what external forces shaped the brain to begin with, and is it receiving a spectrum of consciousness rather than just transmitting it. Firstly, from a scientific point of view, a survey of anecdotal accounts isn't strong enough evidence. If we take as a hypothesis that subjects respond to a particular substance with certain common visual experiences, then you'd need a quantitative study to establish whether it was in fact true, or not. Ideally you'd want to give the drug in question, under controlled conditions, to a sample of people with no experience and no prior knowledge of the drug, and see what percentage of them report particular visual imagery. The problem with online reports is they are self selecting and represent only a small percentage of the total number of users. We don't know if the sample is representative of the population as a whole. Secondly, most people come to Ayahuasca with a lot of prior conscious and unconscious biases—they have heard about it through friends, they have read exactly the kinds of online experiences you have, and are therefore heavily primed to have those kinds of experiences. So for me, personally, the statement "Why do some hallucinogens cause common or universal hallucinations?" is yet to be proved. Even when proved, it could be attributed in part or wholly by prior experiences, context and beliefs. I remain agnostic - it would be amazing if we could demonstrate that there are common hallucinations, but we have yet to do that. Rather than common hallucinations being the base of early spiritualities that cultivated or used these plants, the culture and context could be the base of the common hallucinations. Probably a better way to look at that would be as a dynamic process: the hallucinations influence the culture, the culture and environment influence the hallucinations. Like nature & nurture, neither exists in a vacuum—more like a dialectical relationship. I think we're a long way from having a neuroscience answer to this question; it's currently more a matter for anthropology and philosophy. There a number of possible causes for similar visionary experiences on hallucinogens. Most people who work with them tend to think that 'hallucinogen' is a misnomer, since there is evidence to show it's possible to see "real" things (in other words things not purely generated by the mind) while under the influence of hallucinogens. Some examples include visions of the future which prove to be accurate, or receiving new knowledge that is verifiable. From a scientific point of view, David Lewis-Williams has done a lot of research in this area and has published a number of books on the subject. His theory is that our optic system generates consistent shapes during altered states, which give rise to similar experiences. Another scientific perspective is the theory of parallel universes, combined with the possibility that certain substances enable human visions of specific things and/or places in other dimensions. A further possibility is the phenomena of psychological conditioning, whereby listening to stories of other people's visions may create an expectation and result in self-generation of a similar experience. A common hypothesis amongst users of hallucinogens is that the source plant has a spirit and the user is interacting with that specific spirit. This is animism, which is a very old form of spirituality, common among indigenous users of hallucinogenic plants. It may not account for the common visions from synthetic hallucinogens such as LSD experience though. A person's beliefs seem to play a significant role in what they experience under the influence of hallucinogens. For example while there are certain common similarities between visions, there can also be very significant variations. One example is the influence of religious beliefs, whereby a Christian may encounter Christ and a Hindu may see Ganesh. This supports the psychological conditioning theory. Given the unfathomable complexities of human consciousness, it's most likely a combination of these theories plus a bit more that we don't know about yet!